by Andy Higgs in Eat, Drink and Be Merry, Europe, Features, Italy, Places. Italian cuisine is often lumped into one category – a process smoothed by generic tourist-orientated restaurants in major cities – but the fact is that every city has its own distinctive cuisine, and Rome is no different. When visiting the Italian capital with your Rome Pass, you will be able to find out for yourself that typical Roman cuisine tends to be very simple “people’s food” with good, basic ingredients, chief among them being vegetables, especially artichokes, provided by the fertile soil in Lazio. Unlike many other places in Italy and indeed the whole Mediterranean, it is also very common to use strutto (lard) or the fat of prosciutto for cooking instead of olive oil. This, along with the popularity of deep-frying methods, can make some Roman cuisine rather heavy and fatty. Nevertheless, Rome’s culinary fame dates back to the Renaissance period, with the best chefs working for the popes of the times, so if you make the right choices, you’re in for a treat. Generally, when meat is involved in a dish, it is typical in Rome to use the cheaper cuts of the animal, especially offal. No gastronomic visit to Rome is complete without a look around the Testaccio area, where you could traditionally find a wide variety of odd cuts like pig’s brain or trotters. 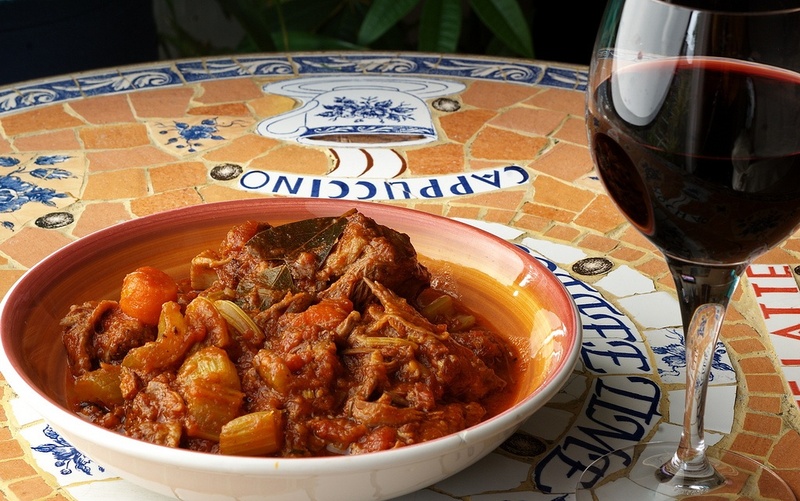 Coda alla vaccinara (butcher-style oxtail) is the quintessential Roman offal dish and includes lard, red wine, celery, garlic and onion, as well as cinnamon and other herbs to produce a richly spiced dish. For a very different flavour and texture, try trippa alla Romana (Roman-style tripe), where tripe is slowly stewed and often served with a tomato sauce including vegetables, cheese and the distinctive flavour of mint. In Rome, there is far less focus on red sauces than in other parts of the country, and there is a greater emphasis on white sauces made with butter, olive oil, and cheese, among which the Roman Pecorino cheese elaborated with sheep’s milk is the most popular. Particularly simple examples of these white sauces are Spaghetti Aglio e Olio (Spaghetti with Garlic and Olive Oil) and Spaghetti Cacio e Pepe (Spaghetti with Cheese and Pepper). Increasing a little in complexity is the Carbonara sauce, the origins and provenance of which are disputed – it may have been Lazio or Umbria or even Naples, and it may have been created in the 19th Century or perhaps following World War II to use up powdered egg and bacon rations left by American troops. Either way, what we do know for sure is that it contains butter, eggs, pancetta, two cheeses (Parmigiano and Pecorino) and black pepper, and that it was a favourite among coal miners (carbone means coal). Also worthy of mention is the Amatriciana sauce, full of flavour with its lard, wine, onions, tomatoes, bacon and pecorino, and is often served with bucatini – especially heavy noodles – for a filling meal. The Jewish Ghetto in Rome has had a great deal of influence on Roman cuisine. 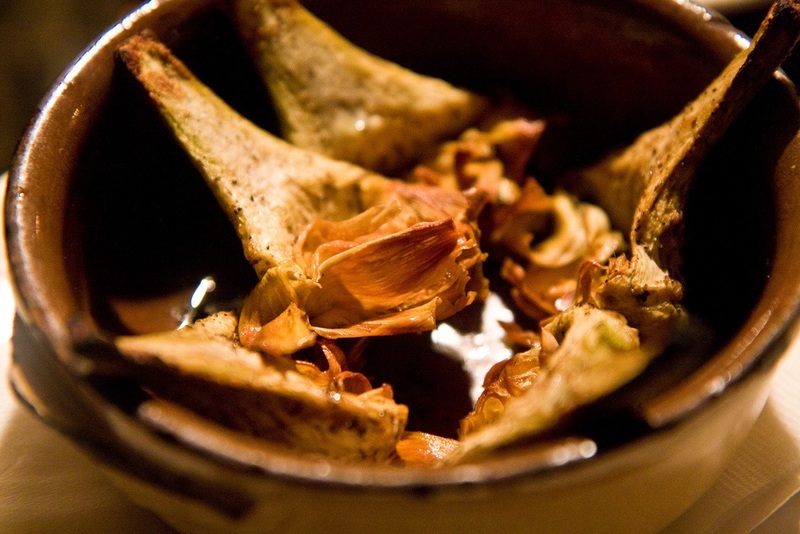 King of all the Roman Jewish dishes is carciofi alla giudea (Jewish-style artichokes), featuring the particularly tender local artichokes which can be eaten whole. Flatten some young artichokes, season and fry in olive oil – simple. Another famous deep-fried dish is Fiori di Zucca Fritti (Fried Zucchini Blossoms). That’s right – the flower of the courgette is the star of this dishes. It’s picked, stuffed with breadcrumbs, anchovies, olive oil, cheese and parsley and then deep-fried. Other favourites include Saltimbocca alla Romana, a delicious veal dish cooked with wine, cheese, prosciutto and sage, plus sometimes capers and butter, and gnocchi alla Romana, where the gnocchi are made with semolina flour instead of the usual potato flour – this dish is traditionally served on a Thursday.